At the UK Commission for Employment and Skills we support opportunities for young people to earn and gain experience of work while they are still learning. Each year we take on a new sandwich year student, who spends a year working with us to gain real-world experience of the workplace and develop the skills that can’t be learnt from a textbook. To support the launch of our latest report, Forging Futures: Building higher level skills through university and employer collaboration, we asked our outgoing student, Daniel Stammers, to explain what he had gained from his year at UKCES, as well as asking our new student, Sarah Marsh, what she was hoping to gain over the next 12 months. I’m studying for a degree in Marketing, Communications and Advertising at Sheffield Hallam University. My course includes an optional placement year in industry, which was something I had looked for deliberately when choosing my course. By choosing this pathway, it means that I will leave university with a years’ work experience, as well as a degree. I have just completed my placement year at UKCES and will now be returning to uni to finish off my final year. University prepared me for work by teaching me various theories, covering subjects relevant to working in business and by making my CV more attractive to employers. Developing these skills at uni was useful but putting them into practice in the workplace was much more valuable to me. I have had a great opportunity to gain work experience in an organisation that allowed me to work across all areas of the business. With communications being a major part of my degree, I gained a lot of experience in this area. I also got to try new things that I wouldn’t have considered before and now find I have a real interest in events management; something I would now seriously consider as a career path in the future. Working with UKCES allowed me to gain a wide variety of skills that have added a new dimension to what I have learnt at university. I have improved my IT skills through real life working tasks, been a part of of organisational teams for events and projects and looked at the components of a successful communication strategy. I also gained a wide variety of personal skills through the working environment and training. These include time management and organisational skills, project management and ways to influence others, giving me the confidence to talk to peers. These really important skills will not just benefit me when I go back to university, but will also make my transition into work much easier in the future. I have rounded off my placement having achieved everything I wanted to and more. Personally I have a lot more confidence in my work and have developed many valuable skills which will benefit me when looking for my future career. I would advise anyone considering university to jump at the chance to do work experience or a placement, to make you stand out over other graduates. This year I am doing a twelve month Communications placement with UKCES as part of my university degree. I am in my third year doing Marketing, Communications and Advertising at Sheffield Hallam University, and I will be returning to university to do my final year after the placement. My degree was designed in conjunction with employers to make sure they produce graduates who are work ready. I was heavily encouraged to go on placement by my professional and academic advisor, but didn’t take a lot of convincing as I already knew that getting work experience would prepare me for the world of work after I graduate. As I am entering a Communications role, I would like to come away next year with a better understanding of all the work that goes into planning and creating a communications campaign. My eagerness to get involved has pushed me straight in at the deep end already, being asked to write this blog and get involved with the Forging Futures campaign. And as a baptism by fire, I have already signed myself up for training days using design software! Up until now my portfolio has mainly contained pieces of university work, but my aim throughout my placement year is to add to it with examples of real-life work so I can demonstrate the skills I develop. I also have a keen interest in politics and economics which is part of the reason why I applied to the organisation to do my placement. I want to l broaden my understanding of how the economy works and the political factors that affect it, and what better place to do that than at UKCES?! I am undecided about the path I would like to go down after University, but if I can come away from this year with a better understanding of Communications and an idea of where I see myself heading, I would consider this year a big achievement. 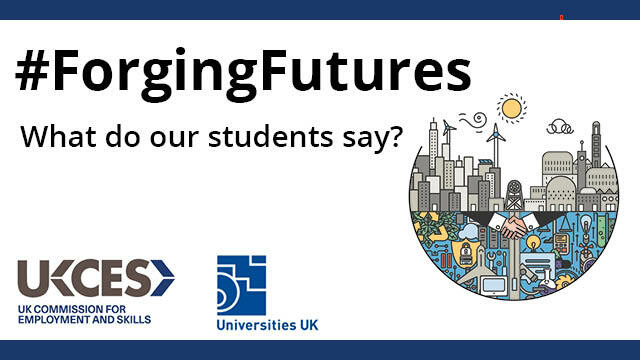 For more on Forging Futures: Building higher level skills through university and employer collaboration, visit the UKCES website or join the conversation using #ForgingFutures on Twitter.